THE BIG LAP … every red-blooded Aussie dreams of, one day, taking off on that huge adventure! Here’s a family who actually did it! 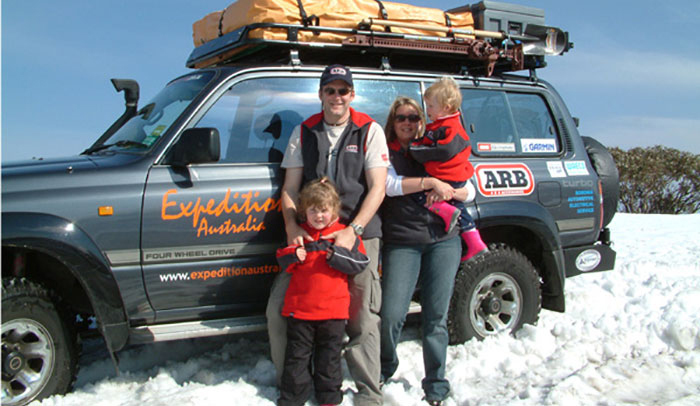 For 16 months, Steve Baile, his wife Jen and their daughters Savanna (aged 4) and Sara (1) travelled Australia. They covered more than 46,600 km through every State and Territory. The BIG LAP … it was the adventure of a lifetime. Along the way they travelled some of Australia’s toughest roads and visited many of the most remote and spectacular destinations. Their goal for the trip was to reach all of the extremes of Australia – that’s the north (Cape York), south (Cape Tribulation), east (Cape Byron), west (Steep Point), the centre (Lamberts Centre) and the highest point at the top of Mt Kosciuszko. They figured that getting to these points would involve a whole lot of adventure along the way . . . and how right they were! That’s the title of a key section of the website Steve Baile built after the family’s adventure. The site has evolved from being just a record of their trip to being a vital source of information and inspiration for others. It covers vehicle preparation to choosing the right gear … travelling with kids to highlighting great destinations … everything you need to know before attempting the big lap. Now the whole adventure is documented on a limited edition 3-disc HD BLURAY SERIES in full HD, released in time for Christmas. And what a great gift that is for the whole family to give Dad. It might inspire him to take you on that BIG LAP! However if you order the Bluray set before 1st September, 2016 and use the coupon code BLURAY10, you will pay only $34.95. 1. Add The Big Lap Bluray Series to your Shopping Basket on the Shop page here http://www.expeditionaustralia.com.au/shop/ – this will then take you to the Shopping Cart page. 2. Type the Coupon Code BLURAY10 into the ‘Coupon Code’ box under the list of products and click ‘Apply Coupon’. 3. The $10.00 discount will be applied to your order total. 4. Click on ‘Proceed to Checkout’ to go to the Secure Checkout page and add your delivery and payment details.